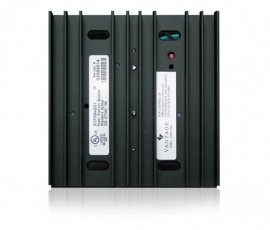 The Vantage Power Station is a large capacity dimmer and power booster. It is designed to handle larger than standard loads. Several models are available from Standard to Electronic Dimmer and available in 120vac and 277vac models. The high capacity heatsink comes with an attractive white cover. Other covers are available in almond, black, brown, and ivory. It may be connected to a dimmed load or directly to the station bus. It will then act as a high-power, single-station dimmer. The Power Station can be controlled by either a dimmed signal from a ScenePoint or Module, or can be controlled directly from the controller by connecting to the station bus. Handles up to 16 Amps for incandescent or 1000 VA of magnetic low voltage loads at 120 volts.